More than just a "chip off the old block," Delino DeShields Jr. is creating a name for himself separate from that of his father. An accomplished base-runner during his career, Delino DeShields Sr. has been quoted as saying that his son is actually faster than he was at the same age. More than just a threat on the base paths, the younger DeShields has a quick bat, and great range in the field. All these factors are putting Delino DeSheilds Jr. cards and memorabilia on a growing number of radars. 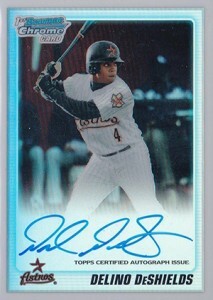 Shop for Delino DeShields Jr. cards on eBay. A first round draft pick by the Houston Astros in the 2010 MLB Amatuer Draft, (8th overall), DeShields Jr. played his high school ball at the esteemed Woodward Academy in College Park, GA. Progressing quickly through the Astros' organization, his patience at the plate is allowing him to increase his on-base percentage. This is where he can do the most damage. A key part of Houston's rebuilding plans, DeShields is definitely on the fast track. Collectors already have several cards to pursue, we've listed the key ones below. The following is a list of key early Delino DeShields Jr. cards released prior to his MLB debut. As a result, none can be classified as official rookie cards, though they are popular nonetheless. Click on the card name to shop for singles on eBay. A key card to serve as the foundation of any Delino DeShields Jr. player collection. Refractor versions are also available and are serial numbered to 500 copies. 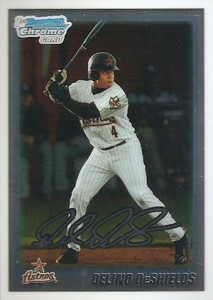 There is also a non-autographed base card version as well. Nearly identical to the autographed version, it's also much less expensive. While the signed version is relatively affordable, autographs aren't for everyone. It's hard to argue about the dollar or two this one will run you. There are also several Refractor versions as well. A slightly higher end offering than the regular Bowman Draft issue, unfortunately, it uses a sticker autograph. An attractive card design counters this and shows DeShields in a nice follow through batting pose. 2014 Bowman Sterling Prospect Auto- Delino Deshields Jr.